For other uses, see Hermitage (disambiguation). The State Hermitage Museum (Russian: Госуда́рственный Эрмита́ж, tr. Gosudárstvennyj Ermitáž, IPA: [ɡəsʊˈdarstvʲɪnɨj ɪrmʲɪˈtaʂ]) is a museum of art and culture in Saint Petersburg, Russia. The second-largest art museum in the world, it was founded in 1764 when Empress Catherine the Great acquired an impressive collection of paintings from the Berlin merchant Johann Ernst Gotzkowsky. The museum celebrates the anniversary of its founding each year on 7 December, Saint Catherine's Day. It has been open to the public since 1852. A hermitage is the dwelling of a hermit or recluse. The word derives from Old French hermit, ermit "hermit, recluse", from Late Latin eremita, from Greek eremites, literally "people who live alone", which is in turn derived from ἐρημός (erēmos), "desert". The building was initially given this name because of its exclusivity - in its early days, only very few people were allowed to visit. Originally, the only building housing the collection was the "Small Hermitage". Today, the Hermitage Museum encompasses many buildings on the Palace Embankment and its neighbourhoods. Apart from the Small Hermitage, the museum now also includes the "Old Hermitage" (also called "Large Hermitage"), the "New Hermitage", the "Hermitage Theatre", and the "Winter Palace", the former main residence of the Russian tsars. In recent years, the Hermitage has expanded to the General Staff Building on the Palace Square facing the Winter Palace, and the Menshikov Palace. The Western European Art collection includes European paintings, sculpture, and applied art from the 13th to the 20th centuries. It is displayed, in about 120 rooms, on the first and second floor of the four main buildings. Drawings and prints are displayed in temporary exhibitions. Since 1940, the Egyptian collection, dating back to 1852 and including the former Castiglione Collection, has occupied a large hall on the ground floor in the eastern part of the Winter Palace. It serves as a passage to the exhibition of Classical Antiquities. A modest collection of the culture of Ancient Mesopotamia, including a number of Assyrian reliefs from Babylon, Dur-Sharrukin and Nimrud, is located in the same part of the building. The collection of classical antiquities occupies most of the ground floor of the Old and New Hermitage buildings. The interiors of the ground floor were designed by German architect Leo von Klenze in the Greek revival style in the early 1850s, using painted polished stucco and columns of natural marble and granite. One of the largest and most notable interiors of the first floor is the Hall of Twenty Columns, divided into three parts by two rows of grey monolithic columns of Serdobol granite, intended for the display of Graeco-Etruscan vases. Its floor is made of a modern marble mosaic imitating ancient tradition, while the stucco walls and ceiling are covered in painting. The Room of the Great Vase in the western wing features the 2.57 m (8.4 ft) high Kolyvan Vase, weighing 19 t (42,000 lb), made of jasper in 1843 and installed before the walls were erected. While the western wing was designed for exhibitions, the rooms on the ground floor in the eastern wing of the New Hermitage, now also hosting exhibitions, were originally intended for libraries. The floor of the Athena Room in the south-eastern corner of the building, one of the original libraries, is decorated with an authentic 4th-century mosaic excavated in an early Christian basilica in Chersonesos in 1854. The collection of classical antiquities features Greek artifacts from the third millennium – fifth century BC, ancient Greek pottery, items from the Greek cities of the North Pontic Greek colonies, Hellenistic sculpture and jewellery, including engraved gems and cameos, such as the famous Gonzaga Cameo, Italic art from the 9th to second century BC, Roman marble and bronze sculpture and applied art from the first century BC - fourth century AD, including copies of Classical and Hellenistic Greek sculptures. One of the highlights of the collection is the Tauride Venus, which, according to latest research, is an original Hellenistic Greek sculpture rather than a Roman copy as it was thought before. There are, however, only a few pieces of authentic Classical Greek sculpture and sepulchral monuments. On the ground floor in the western wing of the Winter Palace the collections of prehistoric artifacts and the culture and art of the Caucasus are located, as well as the second treasure gallery. The prehistoric artifacts date from the Paleolithic to the Iron Age and were excavated all over Russia and other parts of the former Soviet Union and Russian Empire. Among them is a renowned collection of the art and culture of nomadic tribes of the Altai from Pazyryk and Bashadar sites, including the world's oldest surviving knotted-pile carpet and a well-preserved wooden chariot, both from the 4th–3rd centuries BC. The Caucasian exhibition includes a collection of Urartu artifacts from Armenia and Western Armenia. Many of them were excavated at Teishebaini under the supervision of Boris Piotrovsky, former director of the Hermitage Museum. Four small rooms on the ground floor, enclosed in the middle of the New Hermitage between the room displaying Classical Antiquities, comprise the first treasure gallery, featuring western jewellery from the 4th millennium BC to the early 20th century AD. The second treasure gallery, located on the ground floor in the southwest corner of the Winter Palace, features jewellery from the Pontic steppes, Caucasus and Asia, in particular Scythian and Sarmatian gold. Visitors may only visit the treasure galleries as part of a guided tour. Pavilion Hall, designed by Andrei Stackenschneider in 1858, occupies the first floor of the Northern Pavilion in the Small Hermitage. It features the 18th-century golden Peacock Clock by James Cox and a collection of mosaics. The floor of the hall is adorned with a 19th-century imitation of an ancient Roman mosaic. Two galleries spanning the west side of the Small Hermitage from the Northern to Southern Pavilion house an exhibition of Western European decorative and applied art from the 12th to 15th century and the fine art of the Low Countries from the 15th and 16th centuries. The rooms on the first floor of the Old Hermitage were designed by Andrei Stakenschneider in revival styles in between 1851 and 1860, although the design survives only in some of them. They feature works of Italian Renaissance artists, including Giorgione, Titian, Veronese, as well as Benois Madonna and Madonna Litta attributed to Leonardo da Vinci or his school. The Italian Renaissance galleries continues in the eastern wing of the New Hermitage with paintings, sculpture, majolica and tapestry from Italy of the 15th–16th centuries, including Conestabile Madonna and Madonna with Beardless St. Joseph by Raphael. The gallery known as the Raphael Loggias, designed by Giacomo Quarenghi and painted by Cristopher Unterberger and his workshop in the 1780s as a replication of the loggia in the Apostolic Palace in Rome frescoed by Raphael, runs along the eastern facade. The first floor of New Hermitage contains three large interior spaces in the center of the museum complex with red walls and lit from above by skylights. These are adorned with 19th-century Russian lapidary works and feature Italian and Spanish canvases of the 16th-18th centuries, including Veronese, Giambattista Pittoni, Tintoretto, Velázquez and Murillo. In the enfilade of smaller rooms alongside the skylight rooms the Italian and Spanish fine art of the 15th-17th centuries, including Michelangelo's Crouching Boy and paintings by El Greco. The museum also houses paintings by Luis Tristán, Francisco de Zurbarán, Alonso Cano, José de Ribera and Goya. The Knights' Hall, a large room in the eastern part of the New Hermitage originally designed in the Greek revival style for the display of coins, now hosts a collection of Western European arms and armour from the 15th-17th centuries, part of the Hermitage Arsenal collection. The Hall of Twelve Columns, in the southeast corner of the New Hermitage, is adorned with columns of grey Serdobol granite and was also designed in the Greek revival style for the display of coins, is now used for temporary exhibitions. The Gallery of the History of Ancient Painting adjoins the Knights' Hall and also flanks the skylight rooms. It was designed by Leo von Klenze in the Greek revival style as a prelude to the museum and features neoclassical marble sculptures by Antonio Canova and his followers. In the middle, the gallery opens to the main staircase of the New Hermitage, which served as the entrance to the museum before the October Revolution of 1917, but is now closed. The upper gallery of the staircase is adorned with twenty grey Serdobol granite columns and feature 19th-century European sculpture and Russian lapidary works. The rooms and galleries along the southern facade and in the western wing of the New Hermitage are now entirely devoted to Dutch Golden Age and Flemish Baroque painting of the 17th century, including the large collections of Van Dyck, Rubens and Rembrandt. They also contain several paintings by Jan Brueghel the Elder (Velvet period), Frans Snyders (for example, The Fish Market), Gerard ter Borch, Paulus Potter, Jan van Goyen, Ferdinand Bol and Gerard van Honthorst. The first floor rooms on the southern facade of the Winter Palace are occupied by the collections of German fine art of the 16th century and French fine art of the 15th–18th centuries, including paintings by Poussin, Lorrain, Watteau. The collections of French decorative and applied art from the 17th–18th centuries and British applied and fine art from the 16th–19th century, including Thomas Gainsborough and Joshua Reynolds, are on display in nearby rooms facing the courtyard. This area also holds paintings by German artists, including Hans Wertinger, Lucas Cranach the Elder, Barthel Bruyn the Elder, Caspar David Friedrich (Moonrise by the Sea), Anton Mengs, Hans Thoma, Anselm Feuerbach, Franz Stuck (Two Men Fighting Over a Woman) and Heinrich Campendonk as well as paintings by Swiss painters Angelica Kauffman, Alexandre Calame, Arnold Böcklin and Ferdinand Hodler. The richly decorated interiors of the first floor of the Winter Palace on its eastern, northern and western sides are part of the Russian culture collection and host the exhibitions of Russian art from the 11th-19th centuries. Temporary exhibitions are usually held in the Nicholas Hall. The only portion of the second floor open to the public is in the Winter Palace. French Neoclassical, Impressionist and post-Impressionist art, including works by Renoir, Monet, Van Gogh and Gauguin, is displayed there in the southeastern corner. It also displays paintings by Camille Pissarro (Boulevard Montmartre, Paris), Paul Cézanne (Mount Sainte-Victoire), Alfred Sisley, Henri Morel, and Degas. Modern art is displayed in the General Staff Building (Saint Petersburg). It features Matisse, Derain and other fauvists, Picasso, Malevich, Petrocelli, Kandinsky, Giacomo Manzù, Giorgio Morandi and Rockwell Kent. A large room is devoted to the German Romantic art of the 19th century, including several paintings by Caspar David Friedrich. The second floor of the Western wing features collections of the Oriental art (from China, India, Mongolia, Tibet, Central Asia, Byzantium and Near East). 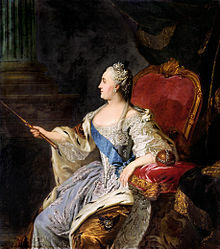 Catherine the Great started her art collection in 1764 by purchasing paintings from Berlin merchant Johann Ernst Gotzkowsky. He assembled the collection for Frederick II of Prussia, who ultimately refused to purchase it. Thus, Gotzkowsky provided 225 or 317 paintings (conflicting accounts list both numbers), mainly Flemish and Dutch, as well as others, including 90 not precisely identified, to the Russian crown. The collection consisted of Rembrandt (13 paintings), Rubens (11 paintings), Jacob Jordaens (7 paintings), Anthony van Dyck (5 paintings), Paolo Veronese (5 paintings), Frans Hals (3 paintings, including Portrait of a Young Man with a Glove), Raphael (2 paintings), Holbein (2 paintings), Titian (1 painting), Jan Steen (The Idlers), Hendrik Goltzius, Dirck van Baburen, Hendrick van Balen and Gerrit van Honthorst. Perhaps some of the most famous and notable artworks that were a part of Catherine's original purchase from Gotzkowsky were Danae, painted by Rembrandt in 1636; Descent from the Cross, painted by Rembrandt in 1624; and Portrait of a Young Man Holding a Glove, painted by Frans Hals in 1650. These paintings remain in the Hermitage collection today. In 1764, Catherine commissioned Yury Felten to build an extension on the east of the Winter Palace which he completed in 1766. Later it became the Southern Pavilion of the Small Hermitage. In 1767–1769, French architect Jean-Baptiste Vallin de la Mothe built the Northern Pavilion on the Neva embankment. Between 1767 and 1775, the extensions were connected by galleries, where Catherine put her collections. The entire neoclassical building is now known as the Small Hermitage. During the time of Catherine, the Hermitage was not a public museum and few people were allowed to view its holdings. Jean-Baptiste Vallin de la Mothe also rebuilt rooms in the second story of the south-east corner block that was originally built for Elizabeth and later occupied by Peter III. The largest room in this particular apartment was the Audience Chamber (also called the Throne Hall) which consisted of 227 square meters. The Hermitage buildings served as a home and workplace for nearly a thousand people, including the Imperial family. In addition to this, they also served as an extravagant showplace for all kinds of Russian relics and displays of wealth prior to the art collections. Many events were held in these buildings including masquerades for the nobility, grand receptions and ceremonies for state and government officials. The "Hermitage complex" was a creation of Catherine's that allowed all kinds of festivities to take place in the palace, the theatre and even the museum of the Hermitage. This helped solidify the Hermitage as not only a dwelling place for the Imperial family, but also as an important symbol and memorial to the imperial Russian state. Today, the palace and the museum are one and the same. In Catherine's day, the Winter Palace served as a central part of what was called the Palace Square. The Palace Square served as St. Petersburg's nerve center by linking it to all the city's most important buildings. The presence of the Palace Square was extremely significant to the urban development of St. Petersburg, and while it became less of a nerve center later into the 20th century, its symbolic value was still very much preserved. Catherine acquired the best collections offered for sale by the heirs of prominent collectors. In 1769, she purchased Brühl's collection, consisting of over 600 paintings and a vast number of prints and drawings, in Saxony. Three years later, she bought Crozat's collection of paintings in France with the assistance of Denis Diderot. Next, in 1779, she acquired the collection of 198 paintings that once belonged to Robert Walpole in London followed by a collection of 119 paintings in Paris from Count Baudouin in 1781. Catherine's favorite items to collect were believed to be engraved gems and cameos. At the inaugural exhibit of the Hermitage, opened by the Prince of Wales in November 2000, there was an entire gallery devoted to representing and displaying Catherine's favorite items. In this gallery her cameos are displayed along with cabinet made by David Roentgen, which holds her engraved gems. As the symbol of Minerva was frequently used and favored by Catherine to represent her patronage of the arts, a cameo of Catherine as Minerva is also displayed here. This particular cameo was created for her by her daughter-in-law, the Grand Duchess Maria Fyodorovna. This is only a small representation of Catherine's vast collection of many antique and contemporary engraved gems and cameos. View of the Palace Embankment by Karl Beggrov, 1826. The Old Hermitage is in the middle of the painting. The collection soon overgrew the building. In her lifetime, Catherine acquired 4,000 paintings from the old masters, 38,000 books, 10,000 engraved gems, 10,000 drawings, 16,000 coins and medals and a natural history collection filling two galleries, so in 1771 she commissioned Yury Felten to build another major extension. The neoclassical building was completed in 1787 and has come to be known as the Large Hermitage or Old Hermitage. Catherine also gave the name of the Hermitage to her private theatre, built nearby between 1783 and 1787 by the Italian architect Giacomo Quarenghi. In London in 1787, Catherine acquired the collection of sculpture that belonged to Lyde Browne, mostly Ancient Roman marbles. Catherine used them to adorn the Catherine Palace and park in Tsarskoye Selo, but later they became the core of the Classical Antiquities collection of the Hermitage. From 1787 to 1792, Quarenghi designed and built a wing along the Winter Canal with the Raphael Loggias to replicate the loggia in the Apostolic Palace in Rome designed by Donato Bramante and frescoed by Raphael. The loggias in Saint Petersburg were adorned with copies of Vatican frescoes painted by Cristopher Unterberger and his workshop in the 1780s. Catherine succeeded in accomplishing a huge achievement in the art world. She collected thousands of impressive pieces of artwork that were numerous in size and value. In her collection, at least 4,000 paintings came to rival the older and more prestigious museums of Western Europe. Catherine took great pride in her collection, and actively participated in extensive competitive art gathering and collecting that was prevalent in European royal court culture. Through Catherine's art collection, she gained European acknowledgment and acceptance, and portrayed Russia as an enlightened society, another feat that Catherine took great pride in. Catherine went on to invest much of her identity in being a patron for the arts. She was particularly fond of the popular deity, Minerva, whose characteristics according to classical tradition are symbolic of military prowess, wisdom, and patronage of the arts. Using the title, Catherine the Minerva, she personally created new institutions of literature and culture and also participated in many projects of her own, mostly having to do with play writing. The representation of Catherine alongside Minerva would come to be a known tradition of enlightened patronage in Russia. In 1815, Alexander I of Russia purchased 38 pictures from the heirs of Joséphine de Beauharnais, most of which had been looted by the French in Kassel during the war. The Hermitage collection of Rembrandts was then considered the largest in the world. Also among Alexander's purchases from Josephine's estate were the first four sculptures by the neoclassical Italian sculptor Antonio Canova to enter the Hermitage collection. Eventually the imperial collections were enriched by Greek and Scythian artifacts excavated within the Russian Empire. Between 1840 and 1843, Vasily Stasov redesigned the interiors of the Southern Pavilion of the Small Hermitage. In 1838, Nicholas I commissioned the neoclassical German architect Leo von Klenze to design a building for the public museum. Space for the museum was made next to the Small Hermitage by the demolition of the Shepelev Palace and royal stables. The construction was overseen by the Russian architects Vasily Stasov and Nikolai Yefimov in 1842–1851 and incorporated Quarenghi's wing with the Raphael Loggias. In 1851, in Venice the museum acquired the collection of Cristoforo Barbarigo, including five more canvases by Titian. Today, all of the paintings but one (Danaë) by Titian in the Hermitage Museum came to St. Petersburg from the Barbarigo collection. The New Hermitage was opened to the public on 5 February 1852. In the same year the Egyptian Collection of the Hermitage Museum emerged, and was particularly enriched by items given by the Duke of Leuchtenberg, Nicholas I's son-in-law. Meanwhile, in 1851–1860, the interiors of the Old Hermitage were redesigned by Andrei Stackensneider to accommodate the State Assembly, Cabinet of Ministers and state apartments. Stakenschneider created the Pavilion Hall in the Northern Pavilion of the Small Hermitage in 1851–1858. Until the 1920s, the museum's entrance was under the portico supported by five-metre high atlantes of grey Serdobol granite from Finland in the middle of the southern facade of the New Hermitage building. In 1861, the Hermitage purchased from the Papal government part of the Giampietro Campana collection, which consisted mostly classical antiquities. These included over 500 vases, 200 bronzes and a number of marble statues. The Hermitage acquired Madonna Litta, which was then attributed to Leonardo, in 1865, and Raphael's Connestabile Madonna in 1870. In 1884 in Paris, Alexander III of Russia acquired the collection of Alexander Basilewski, featuring European medieval and Renaissance artifacts. In 1885, the Arsenal collection of arms and armour, founded by Alexander I of Russia, was transferred from the Catherine Palace in Tsarskoye Selo to the Hermitage. In 1914, Leonardo's Benois Madonna was added to the collection. Immediately after the Revolution of 1917 the Imperial Hermitage and Winter Palace, former Imperial residence, were proclaimed state museums and eventually merged. The range of the Hermitage's exhibits was further expanded when private art collections from several palaces of the Russian Tsars and numerous private mansions were nationalized and redistributed among major Soviet state museums. Particularly notable was the influx of old masters from the Catherine Palace, the Alexander Palace, the Stroganov Palace and the Yusupov Palace as well as from other palaces of Saint Petersburg and suburbs. In 1922, an important collection of 19th-century European paintings was transferred to the Hermitage from the Academy of Arts. In turn, in 1927 about 500 important paintings were transferred to the Central Museum of old Western art in Moscow at the insistence of the Soviet authorities. In the early 1930s, 70 more paintings were sent there. After 1932, a number of less significant works of art were transferred to new museums all over the Soviet Union. In 1928, the Soviet government ordered the Hermitage to compile a list of valuable works of art for export. In 1930–1934, over two thousand works of art from the Hermitage collection were clandestinely sold at auctions abroad or directly to foreign officials and businesspeople. The sold items included Raphael's Alba Madonna, Titian's Venus with a Mirror, and Jan van Eyck's Annunciation, among other world known masterpieces by Botticelli, Rembrandt, Van Dyck, and others. In 1931, after a series of negotiations, Andrew W. Mellon acquired 21 works of art from the Hermitage and later donated to form a nucleus of the National Gallery of Art in Washington, D.C. (see also Soviet sale of Hermitage paintings). With the German invasion of the Soviet Union in 1941, before the Siege of Leningrad started, two trains with a considerable part of the collections were evacuated to Sverdlovsk. Two bombs and a number of shells hit the museum buildings during the siege. The museum opened an exhibition in November 1944. In October 1945 the evacuated collections were brought back, and in November 1945 the museum reopened. On 15 June 1985, a man later judged insane attacked Rembrandt's painting Danaë, displayed in the museum. He threw sulfuric acid on the canvas and cut it twice with his knife. The restoration of the painting had been accomplished by Hermitage experts by 1997, and Danaë is now on display behind armoured glass. In 1991, it became known that some paintings looted by the Red Army in Germany in 1945 were held in the Hermitage. Only in October 1994 the Hermitage officially announced that it had secretly been holding a major trove of French Impressionist and Post-Impressionist paintings from German private collections. The exhibition "Hidden Treasures Revealed", where 74 of the paintings were displayed for the first time, was opened on 30 March 1995, in the Nicholas Hall of the Winter Palace and lasted a year. Of the paintings, all but one originated from private rather than state German collections, including 56 paintings from the Otto Krebs collection, as well as the collection of Bernhard Koehler and paintings previously belonging to Otto Gerstenberg and his daughter Margarete Scharf, including world-famous Place de la Concorde by Degas, In the Garden by Renoir, White House at Night by Van Gogh, and some other collections. Some of the paintings are now on permanent display in several small rooms in the northeastern corner of the Winter Palace on the first floor. In 1993, the Russian government gave eastern wing of the nearby General Staff Building across the Palace Square to the Hermitage and the new exhibition rooms in 1999. Since 2003, the Great Courtyard of the Winter Palace has been open to the public providing another entrance to the museum. Also in 2003, the Museum of Porcelain opened as a part of the Hermitage on the basis of the Imperial Porcelain Factory. In December 2004, the museum discovered another looted work of art: Venus disarming Mars by Rubens was once in the collection of the Rheinsberg Palace in Berlin, and was apparently looted by Soviet troops from the Königsberg Castle in East Prussia in 1945. At the time, Mikhail Piotrovsky said the painting would be cleaned and displayed. The museum announced in July 2006, that 221 minor items, including jewelry, Orthodox icons, silverware and richly enameled objects, had been stolen. The value of the stolen items was estimated to be approximately $543,000 but by the end of 2006 several of the stolen items were recovered. In recent years, the Hermitage launched several dependencies abroad and domestically. The dependency of the Hermitage Museum in Amsterdam is known as the Hermitage Amsterdam, and is located in the former Amstelhof building. It opened on 24 February 2004 in a small building on the Nieuwe Herengracht in Amsterdam, awaiting the closing of the retirement home which still occupied the Amstelhof building until 2007. Between 2007 and 2009, the Amstelhof was renovated and made suitable for the housing of the Amsterdam Hermitage. The Amsterdam Hermitage was opened on 19 June 2009 by President Dmitry Medvedev and Queen Beatrix of the Netherlands. The Hermitage dependency in Kazan (Tatarstan, Russia), opened in 2005. It was created with support from President of the Republic of Tatarstan Mintimer Shaimiev and is a subdivision of the Kazan Kremlin State Historical and Architectural Museum-Park. The museum is situated in the Kazan Kremlin in an edifice previously occupied by the Junker School built in the beginning of the 19th century. Following the prior experiences in London, Las Vegas, Amsterdam and Kazan, the Hermitage foundation decided to create a further branch in Italy with the launch of a national bid. Several northern Italian cities expressed interest such as Verona, Mantua, Ferrara and Turin. In 2007, the honor was awarded to the city of Ferrara which proposed its Castle Estense as the base. Since then, the new institution called Ermitage Italia started a research and scientific collaboration with the Hermitage foundation. Hermitage-Vyborg Center was opened in June 2010 in Vyborg, Leningrad Oblast. A Hermitage branch is due to open in Vladivostok by 2016, and the regional government has allocated more than Rb17.7 million ($558,000) for preliminary reconstruction work on a mansion in Vladivostok's historic downtown district to house the satellite. The Hermitage-Siberia is due to open in Omsk in 2016. In recent years, there have been proposals to open a Vilnius Guggenheim Hermitage Museum in the capital city of Lithuania. Like the former Las Vegas dependency, the museum is to combine artworks from the Saint Petersburg Hermitage with works from the New York Guggenheim Museum. The Guggenheim Hermitage Museum in Las Vegas opened on 7 October 2001 and closed on 11 May 2008. The Hermitage Rooms in London's Somerset House opened on 25 November 2000. The exhibition was closed permanently in November 2007 due to poor visitor numbers. The Hermitage Volunteer Service offers all those interested a unique opportunity to involve themselves in running this world-renowned museum. The program not only aids the Hermitage with its external and internal activities but also serves as an informal link between the museum staff and the public, bringing the specific knowledge of the museum's experts to the community. Volunteers may also develop projects reflecting their own personal goals and interests: communicate a feeling of responsibility to the youth so as to help them understand the value of tradition and the necessity of its preservation. A population of cats lives on the museum grounds and serves as an attraction. Russian Ark (2002), the Russian film by Alexander Sokurov, was filmed entirely in the Hermitage Museum, showing the Winter Palace at various stages of its history. War and Peace (1966–67), an Oscar-winning Soviet adaptation of the novel by Leo Tolstoy, was partially filmed in the Winter Palace. ‘Culture,’ a Russian national television channel, has been presenting the various art collections of the Hermitage to the general public for years. There are a series of programs that have aired entitled ‘My Hermitage’ that have been particularly successful. All of these programs are organized by the Director of the Hermitage, Professor Mikhail Piotrovsky, and are quite similar to the broadcasts created by Academician Boris Piotrovsky, who is Mikhail's father. These programs were first broadcast through the Soviet Union's ‘First’ channel, airing at the height of the museum's boom. During this time, this channel recorded more than three million visitors every year, mostly from the Soviet Union. Another program created by the Hermitage was called ‘The Treasures of St. Petersburg,’ and was broadcast on the St. Petersburg regional television. This program gave insight into what exhibitions were being displayed at the Hermitage. 'Hermitage Revealed' (2014) is a BBC documentary from Margy Kinmonth. The film tells the story of its journey from imperial palace to state museum, investigating remarkable tales of dedication, devotion, ownership and ultimate sacrifice, showing how the collection came about, how it survived tumultuous revolutionary times and what makes the Hermitage unique today. To the Hermitage, by Malcolm Bradbury, retells the story of Diderot's journey to Russia to meet Catherine the Great in her Hermitage. 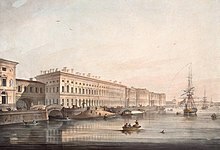 Petersburg, by Andrey Bely, features the Winter Canal near the palace as one of its central locations, but never names the Winter Palace directly. Ghostwritten, by David Mitchell, features as one of its protagonists a woman who works for an art counterfeiting ring whilst masquerading a docent in a gallery room on the upper floor of the Large Hermitage. The Madonnas of Leningrad, a novel by Debra Dean, features the Hermitage during World War II. The Hermitage appears in the video games Civilization IV, Civilization V and Civilization VI as a wonder of the world. The Hermitage appears in the first mission of the Soviet campaign in the video game Command and Conquer: Red Alert 3; it is under attack from forces of the Empire of the Rising Sun. ^ "Mikhail Piotrovsky". The State Hermitage Museum. Retrieved 19 June 2016. ^ "Traditional Meeting with Journalists: Farewell to White Nights - 2005". www.hermitagemuseum.org. Archived from the original on 17 February 2012. ^ Piotrovsky, Mikhail, “The Hermitage in the Context of the City,” Museum International 55, no. 1, 79-80. ^ Mason, Mary Willan, “The Treasures of Catherine the Great from the State Hermitage Museum St. Petersburg,” Antiques & Collecting Magazine 106, no. 3, 62. ^ "Hermitage History: The Raphael Loggias". www.hermitagemuseum.org. Archived from the original on 11 September 2012. Retrieved 7 September 2012. ^ "Hermitage History: Timeline: 1771-1787: Construction of the Great Hermitage". www.hermitagemuseum.org. Archived from the original on 28 June 2012. Retrieved 7 September 2012. ^ Dianina, Katia, “Art and Authority: The Hermitage of Catherine the Great,” Russian Review 63, no. 4, 634-636. ^ John Russell (4 October 1994). "Hermitage Reveals It Hid Trove of Impressionist Art". The New York Times. Retrieved 25 February 2014. ^ Steven Erlanger (30 March 1995). "Restitution Hermitage, in Its Manner, Displays Its Looted Art". The New York Times. NYTimes.com. ^ "Hermitage History: Timeline: 1995: The exhibition Hidden Treasures Revealed". www.hermitagemuseum.org. Archived from the original on 3 March 2014. ^ "Virtual Tour: 70: Room Displaying "Unknown Masterpieces"". www.hermitagemuseum.org. Archived from the original on 9 February 2014. ^ "Virtual Tour: 71: Room Displaying "Unknown Masterpieces"". www.hermitagemuseum.org. Archived from the original on 5 October 2013. ^ John Varoli (20 December 2004). "St Petersburg: Rubens looted from Germany discovered at Hermitage". The Art Newspaper. Codart.nl. Retrieved 29 November 2012. ^ Galina Stolyarova (1 August 2006). "Stolen Russian Museum Items Not Insured". The Washington Post. Retrieved 29 November 2012. ^ "The Hermitage-Kazan Exhibition Center, Tatarstan". www.hermitagemuseum.org. Archived from the original on 8 August 2014. ^ "ErmitageItalia Homepage". Ermitageitalia.com. Archived from the original on 16 March 2012. Retrieved 7 September 2012. ^ a b Sophia Kishkovsky (6 November 2013), Launch (museum) satellites, says Putin Archived 7 November 2013 at the Wayback Machine The Art Newspaper. ^ Ben Sisario (12 June 2008). "ARTS, BRIEFLY; Lithuania Approves Guggenheim Project". The New York Times. NYTimes.com. Retrieved 30 May 2012. ^ "Guggenheim Hermitage Museum in Las Vegas concludes seven-year residency at the Venetian Hotel-Resort-Casino" (Press release). Guggenheim Foundation. 9 April 2008. Archived from the original on 4 January 2013. Retrieved 29 November 2012. ^ "The Hermitage Rooms in Somerset House, London". www.hermitagemuseum.org. Archived from the original on 8 August 2014. ^ Philippa Stockley (30 October 2007). "Josephine's farewell from the Hermitage". The Evening Standard. standard.co.uk. Retrieved 29 November 2012. ^ Cole, Teresa Levonian (5 February 2016). "St Petersburg: the cats of the Hermitage". The Telegraph. ISSN 0307-1235. Retrieved 6 March 2018. ^ Matveev, Vladimir, “The Hermitage and its Links with Regions of Russia,” Museum International 55, no. 1, 68. ^ "Civilization Fanatics' Forums - View Single Post - Civ5 Confirmed Features and Versions". Forums.civfanatics.com. Retrieved 7 September 2012. Dutch and Flemish paintings from the Hermitage . New York: The Metropolitan Museum of Art. 1988. Wikimedia Commons has media related to Hermitage Museum.